You know when you use a music or media player - and really, they all do it in some way or another - you can activate a visualiser to help you "see" the track like you were tripping on acid? Well, Atari had one in 1976. And it was, for the time, pretty damn great. 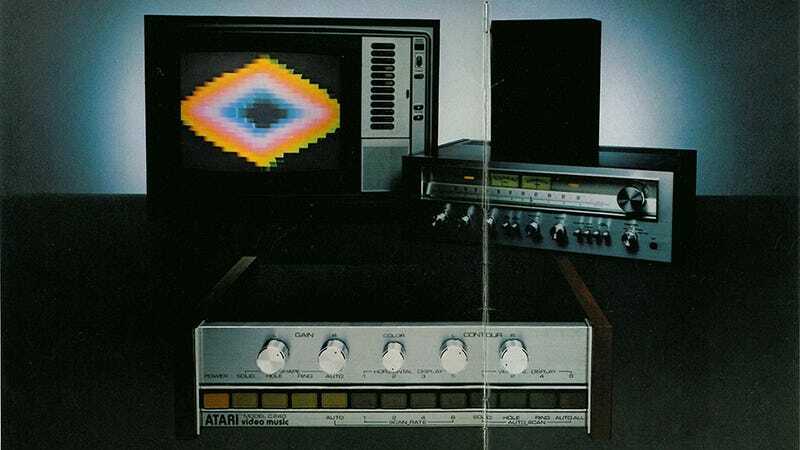 The program was called Atari Video Music, and it worked by hooking it up to both your TV and an amplifier. It wasn't a cartridge for a regular Atari console; the system was a standalone device, sporting a badass 70's combination of woodpanel (a fetish of mine) and brushed metal. Once activated, it would receive the audio from the amplifier, turn it into a crude visualisation then beam it to your TV. The effect was...primitive by modern standards, but for the time, it was pretty neat! The problem is that the thing cost $170, which considering its limited use made it a luxury item that few bothered picking up. Want to see it in action? The Devo video to the left actually features the system in the background from 0:45 in. You can read more about the system, and even see an unboxing video of one, at the link below.